In the morning the major topic of conversation is what happened last night. Don is asking people if they fell out of bed and is looking to see if a log or something has rammed into the boat. When Captain Bill gets up, he solves the mystery. He says that the anchor chain had shifted position with the swinging of the boat in the night and had caused the clank sound. He apologizes to us for not giving us his "things that go bump in the night" talk when we came aboard. He usually does this to allay passengers concerns when they are awaked by such noises. Today is going to be a full day. We will travel several miles before we begin our kayaking. We will do this during breakfast, which is French toast, made with the fresh bread that was purchased from Echo Bay yesterday. This is Don’s favorite dish and early in the eating process, he begins negotiating with other passengers for some of their French toast. He only gets a half of piece fromJane. The other passengers quickly realize how good it is and eat their own portions. The Columbia travels up Sutler’s Channel going past Sullivan Bay Resort on North Broughton Island. This marina and resort center caters to the well–to–do pleasure boaters from Vancouver and the States. There are some very expensive vacation homes there. We head to Grappler Sound on the west side of Watson Island. We continually see Mt Stephen but from different angles. The reflections of this snow capped mountain on the calm waters are magnificent. The weatherman on the short wave radio predicted a cloudy stormy day, but he is wrong. We have blue skies with scattered fluffy white clouds. By mid–morning we reach our destination. Today we will paddle around Watson’s Island. It should take about four hours and we will carry our lunch with us. Bill will take the Columbia on ahead and be at our destination in Burley Bay. This is Bill’s day off, when he works to keep the boat shipshape. We launch the kayaks in Grappler Sound. We keep the same pairings that we had yesterday, men in front, women in the stern. The initial waters are tricky because the tide is coming in. The tide creates cross currents and eddy pools along the channel that we are paddling. We paddle our kayaks into the current and ride it, much as one would do on a river. We respect the eddy pools and all of our paddlers do very well. Team Canada (Don and Jennifer) move out ahead so they can explore the shore line on both sides of the channel. Team California is out in front with Kris paddling like a machine. He verbally provides directional assistance to Shanna who gracefully paddles in her own way. Nathan and Nancy are busy taking pictures at every photo opportunity, catching the many views of Mt. Stephen. Peter and Jane, and Frank and Mariana paddle down the middle at their own pace. Sharon and Lorna provide guidance in their single kayaks. After the bit of swift current, we settle down to paddle as synchronized units and really enjoy the day. The weather is perfect. We see an eagle soaring overhead. Suddenly we hear an unexpected sound. It comes from the left bank and seems to be in response to the eagle’s calls or to our presence. Someone says that sounds like a dog yelping, which is totally unexpected out here in the Wilderness. Sharon speaks up, "It could be a dog. 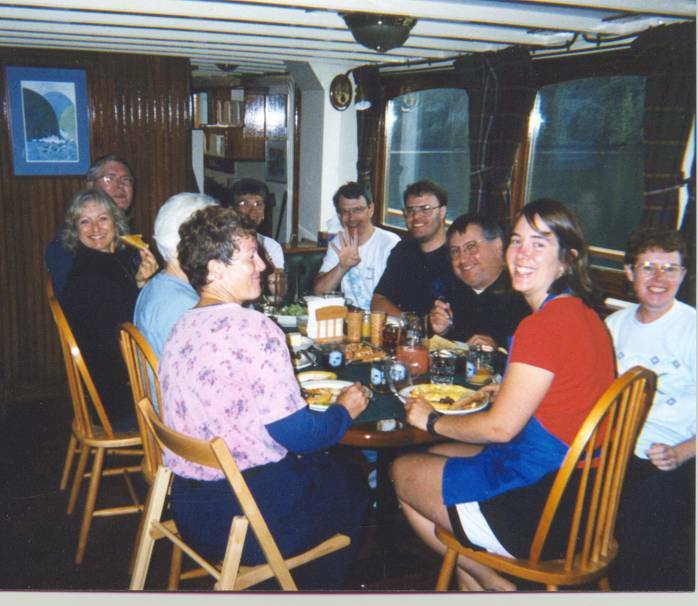 I heard a report over the short wave radio a day or two ago about a dog that was lost overboard in McKenzie Sound, which is not too far from here." So we alter our paddling direction and steer for the left bank. We still can not see anything,but the yelping becomes more distinct. Our ears guide us to the underbrush, and there is a blue grey, short haired dog. Lorna moves into position, Peter and Jane, and Nathan and Nancy move to provide support. The dog is standing on a narrow ledge of rock just above water level and is surrounded by branches from the overhanging trees. He is wet and scared. Lorna gets out of her kayak and approaches him. He lets her pet his head. But she can not get him to come toward her.When she tries to pull him toward her kayak in the water he growls. He seems to be very afraid of the water. Sharon decides that we need some help. She calls Bill on her walkie talkie. The Columbia is already at anchor but he agrees to come with the skiff. He calls Sullivan Bay Resort and gets more information about the missing dog. We wait for about 30 minutes. Lorna gets back into her kayak, because her feet are getting very cold. The dog whimpers like it is afraid that we are going to leave. He continues to cower on his little ledge. We try to give him fresh drinking water in Mariana’s hat, but he does not take any. We note the presence of fresh water streamlets running down the hillside near the dog and assume he has been able to get water. We do not have any food to offer him. Captain Bill arrives in the skiff and drives right up to the bank where the dog is. He has to work awhile to clear away the obstructing branches which he does with Lorna’s help. When the branches are clear, he gets behind the dog and pushes it into the boat. The scene of Sparky's rescue. The dog is delighted to go into the skiff. Once aboard the skiff, the dog begins to look around and behave normally. Captain Bill takes him back to the Columbia and feeds him a can of salmon mixed with liberal quantities of fresh water. The dog eats it greedily. Later that day, people from Sullivan Bay Resort come to the Columbia and pick up the dog. They tells us that his name is Sparky. He is an Australian Cattle dog called a Blue Heeler and belongs to the William Bressler family from Seattle. They were vacationing in these waters earlier in the week. They had taught Sparky how to swim, though he did not like the water. They also had a life-vest for Sparky that he wore when they were traveling in rough seas. They missed him on Tuesday, August 24 when they starting on their trip home. They noted that he did not have his life vest on. They searched for him for a day and sent out radio messages. The Canadian Coast Guard assisted in the search. On August 25, they gave up the search and headed home. The happy conclusion to this story is as follows. Bob and Lynn Whitehead, the owners of the Sullivan Bay Resort, took care of Sparky until they had made contact with the Bresslers (Sunday,August 29). They arranged for Sparky to fly home free of charge on Kenmore Air floatplane on Tuesday, August 31. 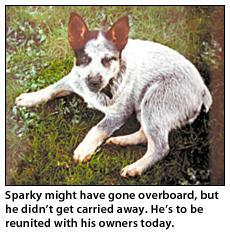 Sparky’s story made the Seattle news on Monday, August 29. Nancy was back in Seattle then and she called the TV station to find out how to contact the family. The TV station had someone out to interview Nancy within 20 minutes. Sparky’s story made the front page of the Seattle Times on August 31, the day he arrived home. Five TV stations were present for Sparky’s arrival in Seattle. That night he got an elk dinner and got to sleep in bed with the family rather than in his dog house. Nancy was interviewed again, and showed her own pictures of Lorna discovering Sparky in the underbrush near Turnout Bay. This is an amazing canine interest story and demonstrates one of the advantages of travelling quietly in the wilderness. Now let’s return to our paddlers on Watson Island. After Captain Bill left with Sparky, we paddle into Turnout Bay and land at a timber company site. The beach that Sharon had anticipated using is now underwater because our dog rescue had delayed us and the tide is rising. We eat our lunch on the rocks by the landing. The topic of conversation is our dog rescue. In the distance we see roaring rapids, a narrow channel where the tide creates standing waves when it is coming in or going out. The direction of the waves changes according to the water flow. Sharon recounts stories of two other rescues that she and Bill have been involved in. One rescue was of a pair of fawn’s who were unable to get out of the water when crossing a channel and the other was of a harbor seal pup who was pinned in some rocks very near the roaring rapids. They were able to move the rocks with some external leverage. When they were done rescuing the baby seal, they had lost their opportunity to easily get through roaring rapids. So they had to run the rapids in their tandem kayak. Sharon said it was an adventure too, because Bill is not an experienced kayaker. After lunch we continue our circumnavigation of Watson Island with a tug boat and cradle of logs ahead of us. We might have been able to keep up with it, but we stop several times along the way to view the scenery. The paddling partners work well today and our group readily makes its way down to Burley Bay where the Columbia is waiting. It seems like a long day of paddling for most of us. But we all feel good about the dog rescue and our ability to handle distance and currents in this wilderness. Burley Bay is a U–shaped harbor with steep, rocky hills on either side. On one of the hills is an exposed rock, much like that in Echo Bay. There are rocky beaches at the base of the bay and this is a good area for viewing wildlife. We have a spaghetti dinner this evening. After dinner, Jennifer and Don explore the bay in solo kayaks. Kris and Shanna do so in a tandem. At dusk, Lorna goes out in a kayak, but we do not know why. Shortly after it becomes dark we hear bagpipe music. From below the rock face, Lorna is piping. She is a member of a competition piping band and is an accomplished piper. We have not heard her practice on this trip and are caught by surprise by the sound. Never has bagpipe music sounded more appropriate and in better balance with its environment then on this bay with the echoing of the sound off the rock face. The people who are out kayaking are entranced. They have been communing with the environment and the bag pipe music adds another dimension to that experience. Lorna continues for about 30 minutes going through three sets of tunes. It is a delightful ending to a highly improbable day.